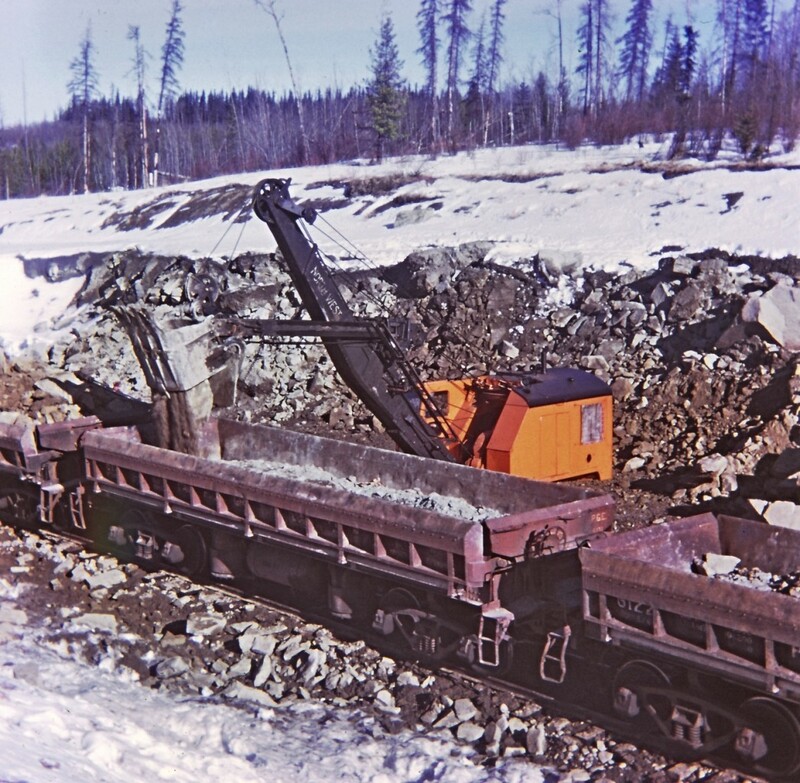 Railpictures.ca - Doug Lawson Photo: In work service, loading rock at mile 765 on the BCR Fort Saint John sub. We will dump the rock to stabilize the footings of the Blueberry River bridge at mile 771.4. This location is now on the Fort Nelson sub account changes in the employee time table and crew assignments. The North West shovel was quite the machine, all done with cables, pulleys and an assortment of levers and foot pedals. Truly was operated by an “operating engineer”, no computer aided joy stick hydraulics on this machine. I was not able to locate this location on the map. | Railpictures.ca – Canadian Railway Photography – photographie ferroviaire Canadienne. Caption: In work service, loading rock at mile 765 on the BCR Fort Saint John sub. We will dump the rock to stabilize the footings of the Blueberry River bridge at mile 771.4. This location is now on the Fort Nelson sub account changes in the employee time table and crew assignments. The North West shovel was quite the machine, all done with cables, pulleys and an assortment of levers and foot pedals. Truly was operated by an "operating engineer", no computer aided joy stick hydraulics on this machine. I was not able to locate this location on the map.